This article covers 4 free online timing diagram maker websites. Timing diagrams are used to represent a set of digital signals in the time domain. A timing diagram can possibly contain multiple rows along with a clock on one axis. Timing diagrams are generally used in electronics, digital communication, and hardware debugging. We will cover 4 free online timing diagram maker websites. With these websites, you can easily make digital timing diagrams online and save them to your computer as PNG, JPG, PDF, or SVG files. The first three websites on this list are online diagram editors whereas the last website is a dedicated online tool to make digital timing diagrams. So, let’s check out these websites one by one. 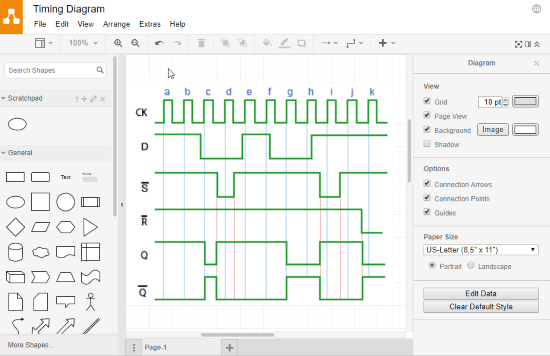 Draw.io is a free online diagram editor where you can make various types of diagrams. 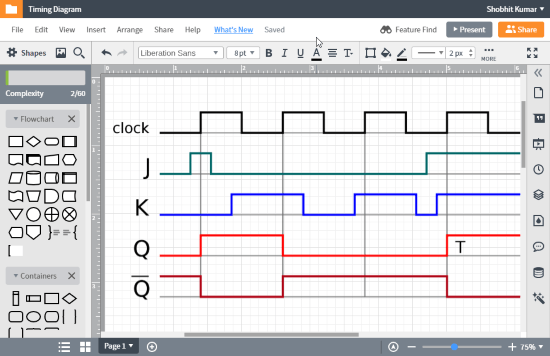 With this editor, you can easily make timing diagrams using the Line tool only. First, you can plot the axis for the diagram and add time domain. Then, you can draw the zero and one signals which are represented horizontally. After drawing the signals, you can connect them by drawing a vertical line from one adjacent signal to another. If you want to add an image or another diagram within your diagram, you can do that too. Draw.io lets you import PNG, JPG, SVG, VSDX, and CSV data files. After completing your diagram, you can export it as a JPG, PNG, SVG, XML, HTML, or VSDX file to your local storage or to the cloud. Create timing diagram online with Draw.io here. 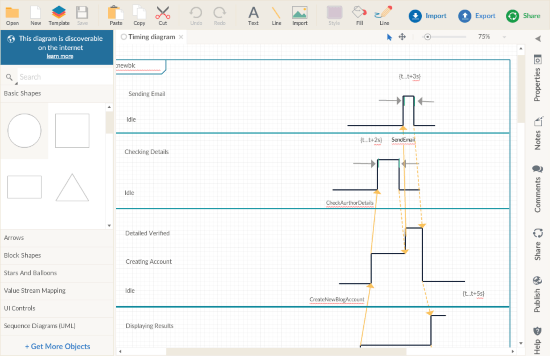 LucidChart is another online diagramming tool to make various types of diagrams online. You can easily make timing diagram with this tool by following the same method as Draw.io. With its multi-purpose Line tool, you can draw the digital signals in respect with the time domain. You can use the different color for different signals to make the diagram more vibrant. Once you are done with the drawing, you download the diagram as a PNG, JPG, SVG, PDF, or XML file. You can also share your diagram on social media and generate HTML embed code to add your diagram on a webpage. Try LucidChart to make timing diagram online here. Creately is yet another online diagramming tool which requires Flash to run. So, before using this tool make sure you have Flash installed on your web browser. Creately has a huge template library which has a handful of templates for timing diagrams. You can either customize those template to make your diagram here or start from the scratch. Making a timing diagram is not any harder than the other websites on this list; all you need is a Line tool. Using the Line tool, you can draw the representation of all the digital signals in your diagram. Then, you can add labels for signals and axes and name your diagram. After completing the drawing part, you can export the diagram as a PNG or JPG file. This tool also generates collaborative shareable URLs which you can share with others for online collaboration. Try this online timing diagram editor here. DaveDrom an online tool to make timing diagram. Instead of offering you an editor, this tool follows a more simple approach. It uses a simple syntax to make the timing diagrams. In the syntax, you can enter the name for the digital signal and add its values. 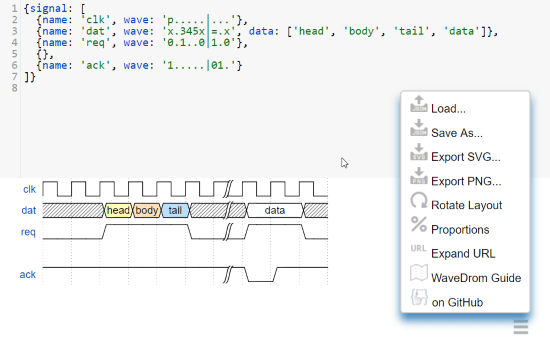 As you type the syntax, this tool instantly plots that signal on the graph. You can also load a JSON syntax in this editor to plot the diagram. After making the diagram, you can export it as a JSON, SVG, or PNG file. You can try this online timing diagram maker website here. These are the 4 free online timing diagram maker websites. With these websites, you can make digital timing diagrams online and export them either to your cloud storage or to your computer.